Fashion Week is a 7 day period in which designer’s from their retrospective country, showcase their pieces for the next year’s season. Consisting of four weeks, starting in New York and finalising in Paris, with a little bit of London and Milan thrown in in-between, it surely is a long and ridiculously busy month. To most fashionistas this month plays a pivotal part in their lives as they grasp onto the new collections and how the trends are to change. However, although the editors, celebrities, stylists, models and more, cling on to this, such shows also play a massive role in the fast fashion industry. With brand head offices throwing their ‘people’ into the designers seats, it allows them to see what they’re to work with and just how their brand can adapt on this. After all, designers are to the ‘normal’ folk ( like me), an indulgence or a treat. If we’re really honest, they’re what we admire in the magazines whilst anxiously waiting for H&M to bash out a lower priced, near identical version. Guaranteed it’s not couture and the population of Manchester purchases it too, but this is where fashion truly lies. How a designers ability to create looks so magical and inspiring that they can transpire from Runway to bloody Runcorn. Not that I know where Runcorn is (yes I’m a little geographically special). The point in this blog being, that although some may believe that fashion weeks are pointless, vain and irrelevant, but they’re not. They provide and shape a style that even the most disgruntled fashion consumer will buy time after time. As at the end of the day, even those who don’t respect the fashion industry still have to buy clothing, whether it be a basic T or a piece of denim. 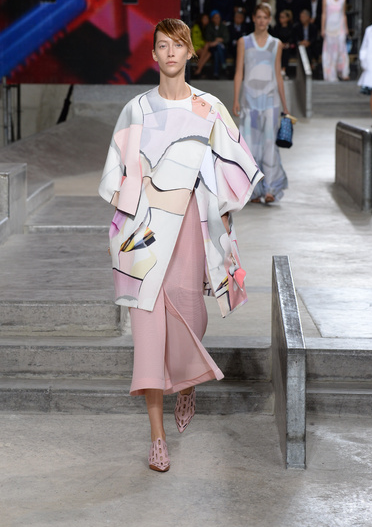 Those fashion merry go round continues to whirl. Being passionate in fashion and the trends that arise, I nosy at the fashion week’s internet feeds, stalk the Instagram accounts and pretty much spend a ridiculous amount on magazines. Ridiculously excited for the start of October and what they are to include as this month to me, alike many others, provides an excitement for the coming season’s. With this I literally cannot wait to get my grubby little mits on what I’ve seen, Primark or Prada. Fashion month I salute you. An outfit for each city-Spring/Summer 2015 faves. New York fashion week: Oscar de la Renta, Patterned cut out overlay with exquisite thick gold belting. 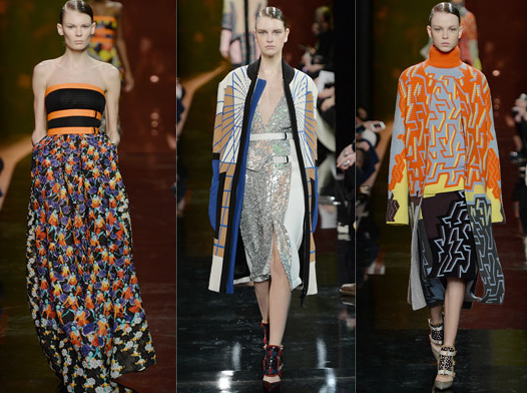 London Fashion Week:Peter Pilotto, electric colours,jazzy prints and exquisite dresses. Milan fashion week: Dolce & Gabbana, Hello Matador, beading and high waisted shorts- SOLD. Previous Post Not wanted at LFW? It’s okay, there’s only a bloody weekend! Next Post Ch, ch, ch, changes…and a fringe.